I am a gamification and games learning enthusiast and was very excited about the idea of an entire text on the topic. The most meaningful and useful part of this text is Part III where they actually talk about games being used for higher learning and games based thinking's potential applications in the field. However, we must first dig through a 100 page outline of academe's issues with technology and adaptation. This has been covered in myriad other texts and done better than in this case. The last section is mixed. Wieland's essay provides interesting counterpoint but had enough typos and over use of "quotation marks" to be distracting to his point. Overall, I did take some notes here and there were some interesting points made from some scholars I hadn't heard from, but this could have been better edited for conciseness and more updated in content. This book is a disappointment because it is narrow. 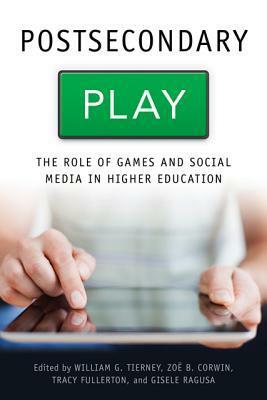 It is important to recognize the subtitle: "The role of games and social media in higher education." Therefore, instead of play being explored with digital and analogue diversity, the focus is on relatively conventional discussions about gaming and social media. Although published in 2014, it is dated to an early moment of digitization, getting down with the kids and their distinctive technology use. There are moments where the under-preparedness of university students is addressed. But the role - and indeed the definition - of 'play' in learning would have been useful.